In our family, we have a collection of different versions of eating grain-free. Personally, I do well on a paleo approach. My husband finds that he feels better eating a variety of pseudocereals (technically, not grains but seeds, although this is probably “splitting hairs” a little as all grains are actually the seed of cereal grasses). 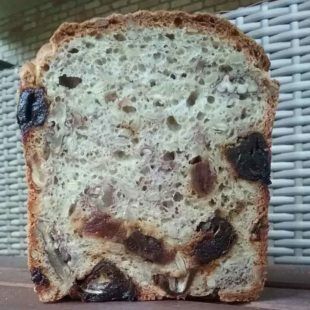 Whether you choose to eat starches or pseudocereals is really up to you but for those of you who do, this recipe is an update on my Fruit and Nut Bread. As it contains egg it is best to consume quickly, or slice and freeze and then toasts straight out of the freezer. 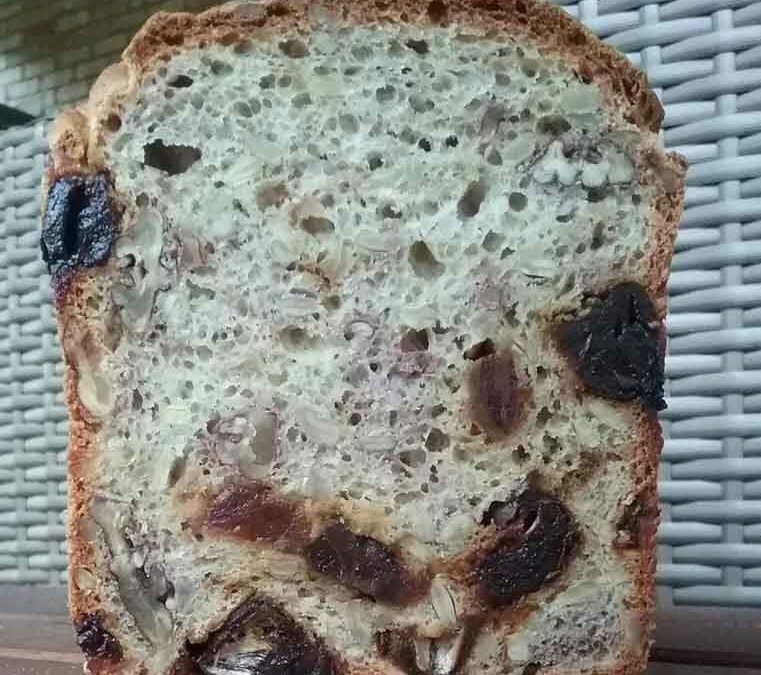 A cafe quality date and pecan bread, this is recipe is great if you can tolerate quinoa flour. Combine flour, salt, yeast, and xanthum gum or substitute and mix well. Add blood temp water, oil, honey (or preferred natural unrefined sweetener of choice) and egg and whisk to combine. Add to dry ingredients and mix well. Mixture will be sticky and thick. Fold in chopped dates, pecans and sunflower seeds. Pour into greased bread tin and smooth, leave in a warm place to rise, which takes 1 to 2 hours. Covering loosely with a plastic bag will help your bread to rise. Cook in a preheated moderate oven for 50 minutes. I use a fan forced oven at 180C (350F). Weigh in your dry ingredients, mix speed 6 4 seconds. Add all wet ingredients and mix 30 seconds speed 6. Scrape down sides and mix 1 minute speed 6. Add dates, pecans and sunflower seeds and mix on reverse, speed 4 to 6 for 10 seconds or until combined. If you prefer not to use xanthum gum (its not paleo and some people react to it) replace with your preferred substitute as outlined here. or better yet, use pixie dust. It is recommended that you use the egg if you don't use the gums. You can use any natural form of sweetener in place of the honey if you prefer, such as coconut sugar, rapadura sugar or rice malt syrup. If you omit the egg, consider adding a substitute such as a chia egg (1 tblsp chia mixed with 3 tblsp boiling water, left 15 mins or until cool and a thick gel forms) or a flax egg (same as for chia egg, use 1 tblsp ground flaxseed instead of chia). Not using egg or gum results in a much denser loaf, still delicious toasted, but with a firmer, chewier texture.